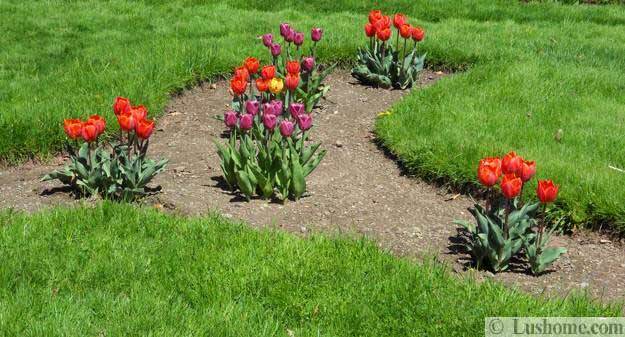 Tulip flower beds are colorful and beautiful sporing garden design ideas. 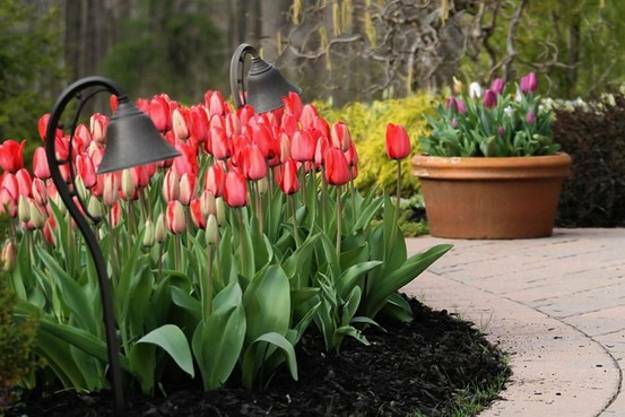 Tender White, yellow, pink, purple and red tulips create spectacular displays and gorgeous centerpieces for spring yard landscaping. 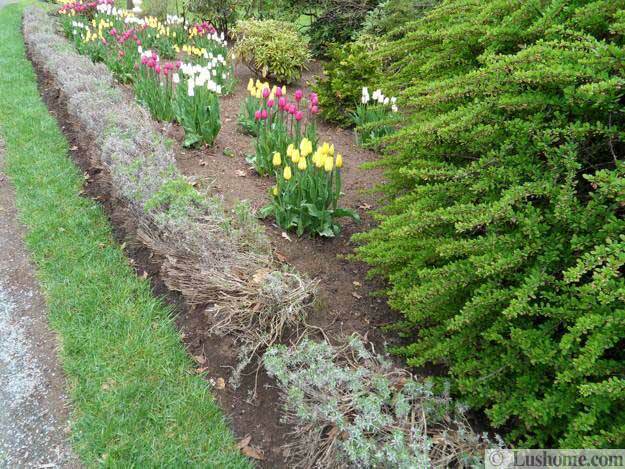 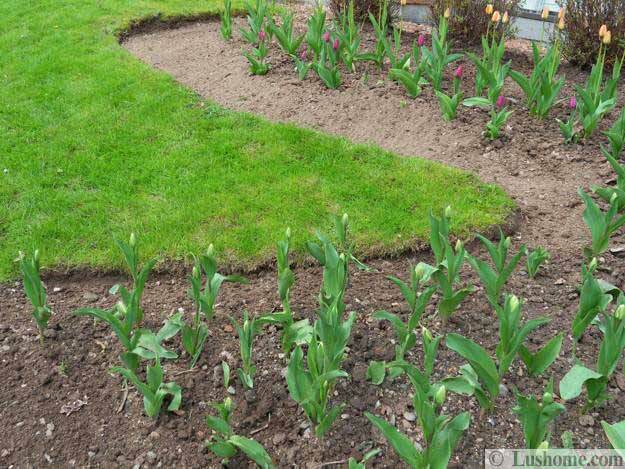 There are a number of ways to combine spring flowers and design tulip beds. 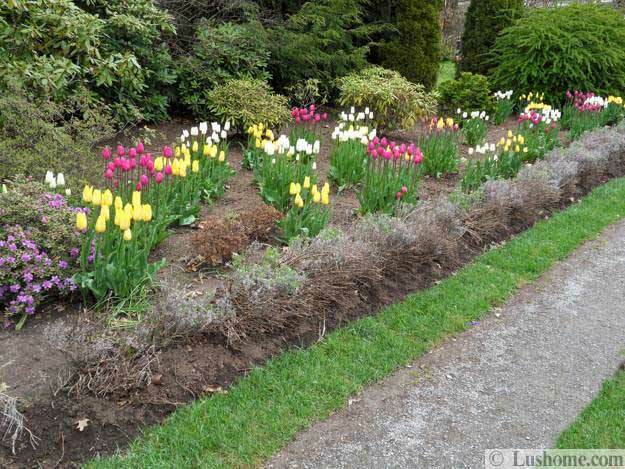 Lushome shares 20 creative and interesting tulip flower beds that you can plan in fall. 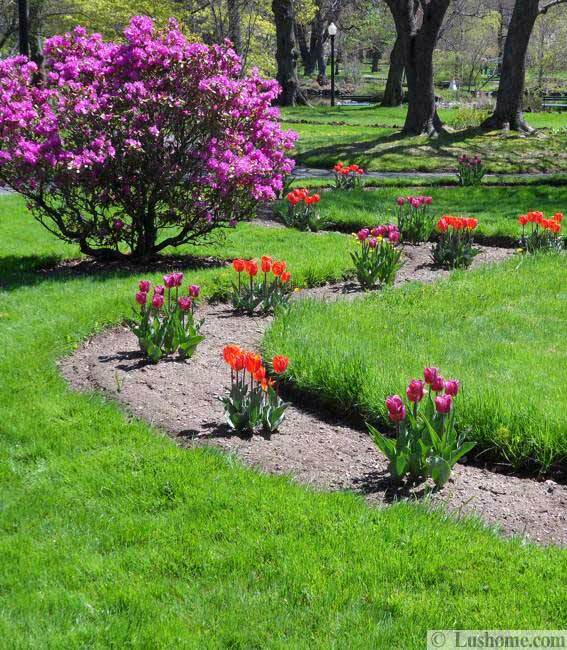 Spring yard landscaping ideas look especially impressive and bright with a mix of various spring flowers and tulips in different shapes and colors. 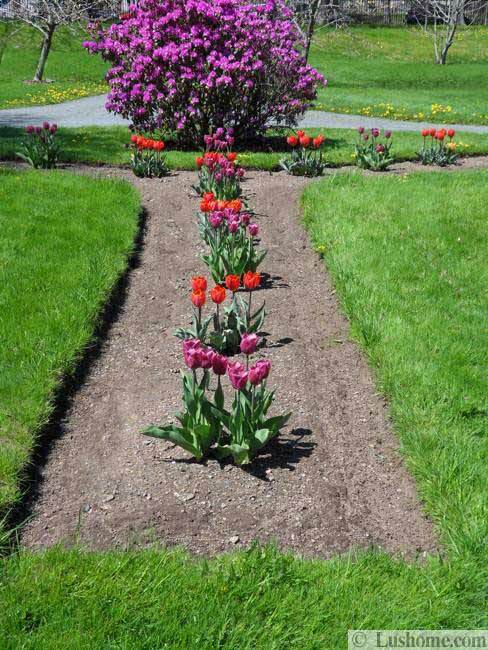 Flower beds with tulips look good in one, two and three colored tulip beds as well as with multicolored spring yard landscaping ideas. 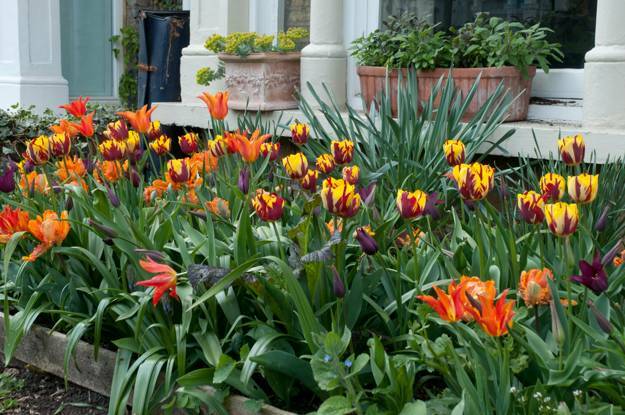 You need to plan ahead your spring garden design ideas, purchase and plant tulip bulbs in fall. 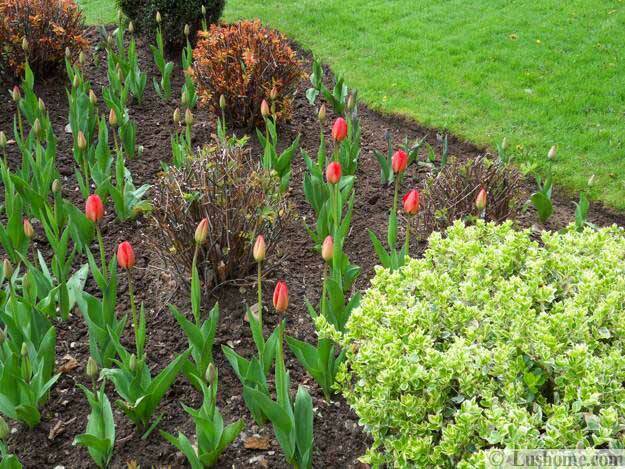 Tulips bloom in spring, and yard landscaping will look gorgeous with fresh leaves, green grass and other blooming plants in various colors. 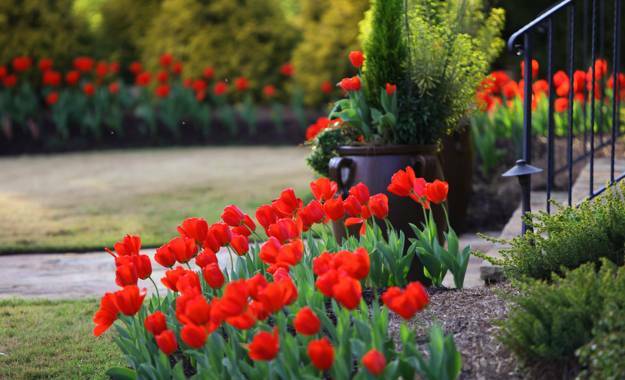 Tulips are gorgeous spring flowers that bloom in mid to late spring, bringing fabulous colors into garden design and accentuate spring yard landscaping. 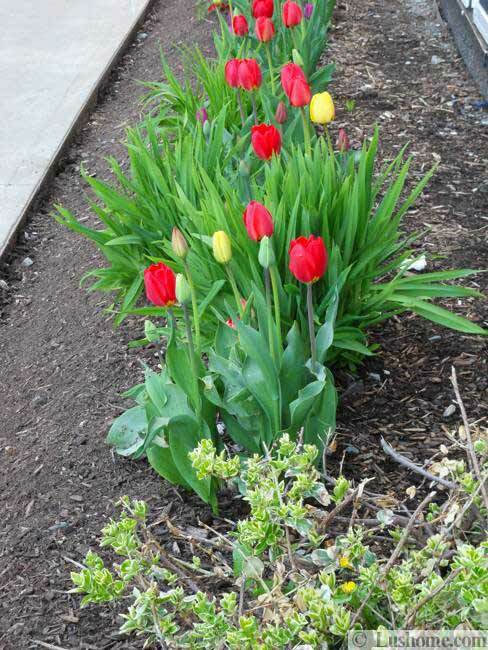 Flower beds with tulips can vary in shapes and color combinations, but they all create impressive centerpieces. 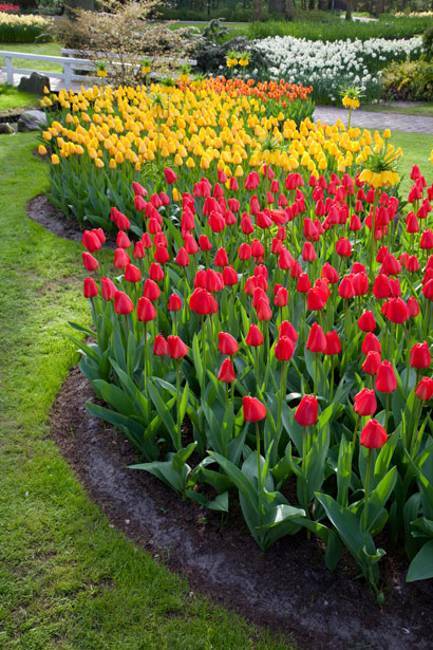 Tulips in white, orange, yellow, pink, purple and red colors add many bright colors to garden design. 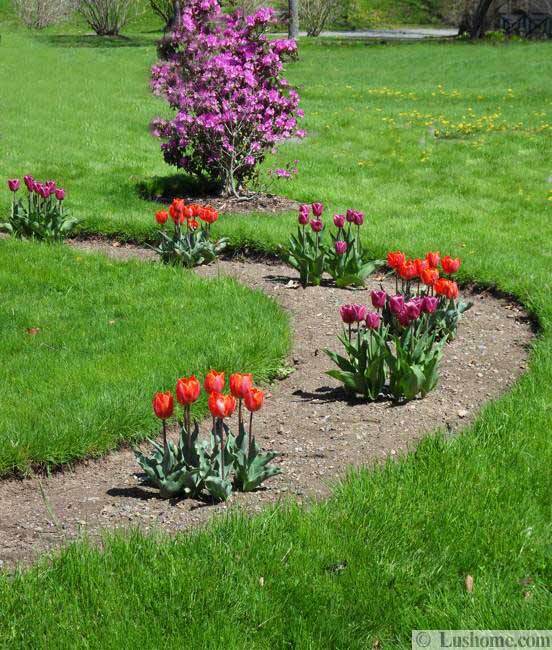 Creative spring yard landscaping can mix tulips with hyacinths and daffodils, miniature tulips can be blended with jumbo sized single blossom tulips. 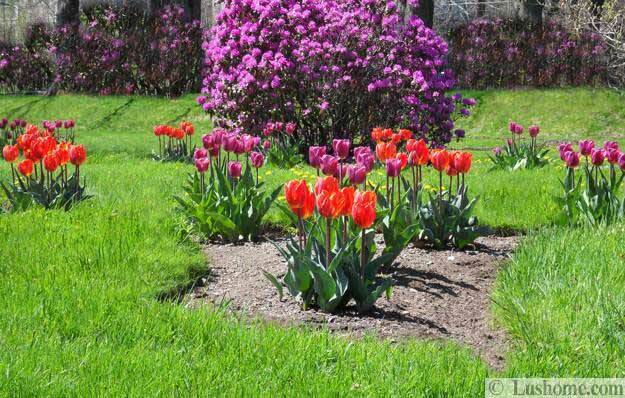 Tulips in a single color or colorful mix of spring flowers in white, orange, yellow, pink, purple and red colors create beautiful garden design with colorful edging and flower beds. 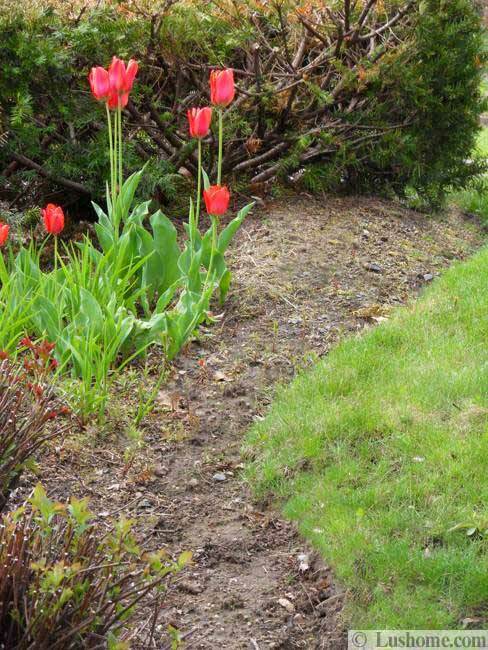 Here is a collection of beautiful sporing yard landscaping ideas that demonstrate how to create attractive flower beds with tulips. 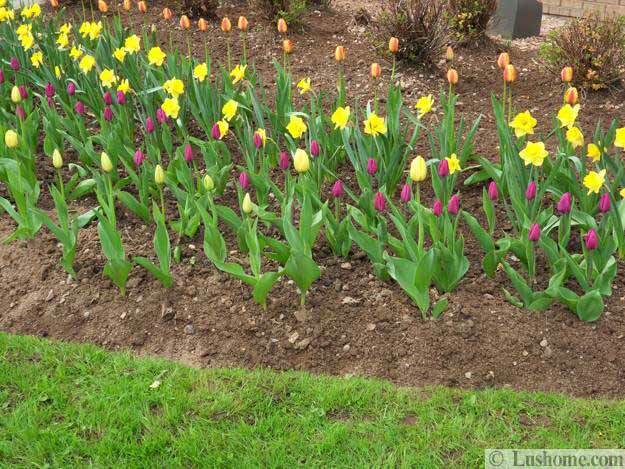 You can plant in a tulip flower beds in fall, mixing bulbs in any color combinations that you want to see in your flower garden. 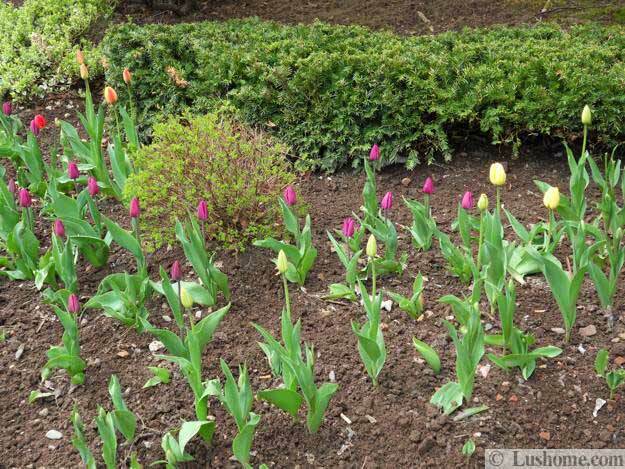 Tulip bulbs need to be planted a few inches apart either in clusters of varied types of tulips or in one-color tulip garden patches. 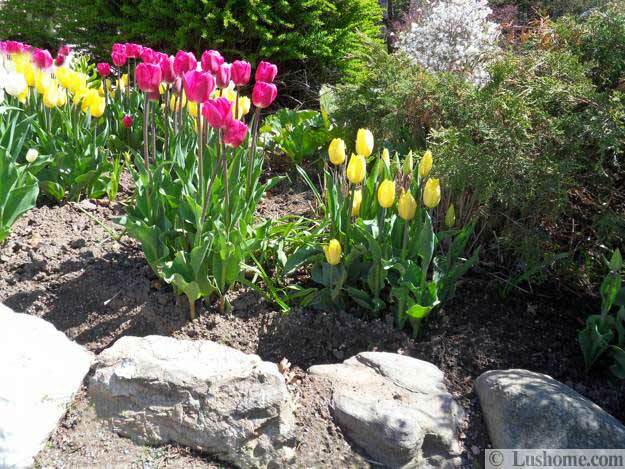 Tulips colors are an important part of creating elegant, exciting and charming garden design. 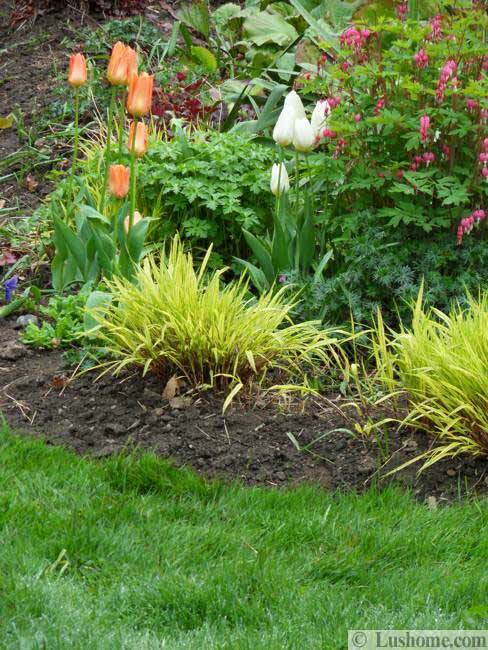 Perfect color combinations add bold accents to spring yard landscaping ideas. 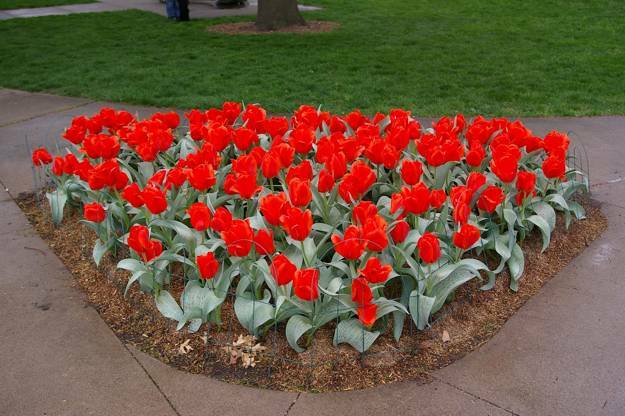 The basic combinations of tulip flowers, like white and pink, red and pink, pink and purple, white and red, yellow and orange, look harmonious and very attractive.